Mr. D is a 23 year old Mobile Money Community Sales Representative (a “WING pilot”) from a small rural town area of Kampot Province along Cambodia’s coastline (about 6 hours’ drive from Phnom Penh, Cambodia’s capital city). Before becoming a WING pilot, Mr. D mixed around with bad company, always giving trouble to his parents and showing no concern and responsibility towards his family. With a Grade 12 high school education and knowing very little English, Mr. D was unable to find a good paying job to fully support himself and had to rely on his parents for help. Mr. D is grateful that WING gave him a second chance in life. 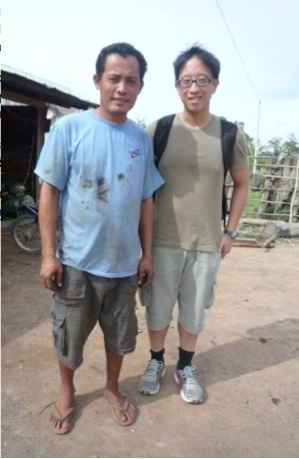 Now, after being a WING pilot for almost 6 months, he has had an opportunity to gain work experience, earn a sustainable monthly income, and improve his English skills. When he first started out as a WING pilot, Mr. D was very nervous and afraid to talk to people. However, with good support from his team leader and teammates Mr. D is now more articulate and able to speak confidently, hence improving his self-esteem. 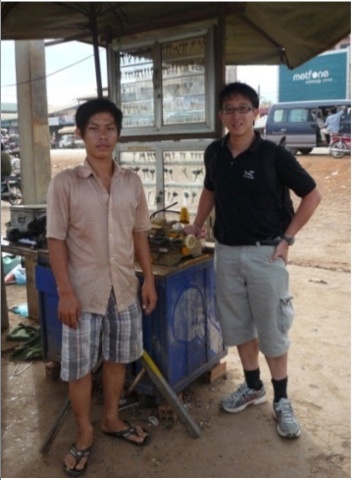 Mr. T is a 22 year old business entrepreneur from a rural district town in Kampong Speu Province. He currently runs his small business as a locksmith. With both parents now deceased, he is the sole financial provider to his family and his younger brother who is studying in a university in Phnom Penh. Before having a WING account, Mr. T had to spend at least 4 hours travelling to Phnom Penh (Cambodia’s capital city) and back to buy locks. This was physically exhausting and wasted valuable time. Mr. T previously used the district bank branch to transfer money to his brother, but his brother finds bringing along his identification card for verification troublesome, and the service fee is expensive. Presently, Mr. T uses the WING service to transfer money to his brother in Phnom Penh more efficiently and cheaply. This helps to support his brother’s studies. Mr. T also transfers money to his brother’s WING account, enabling his brother to buy locks from the nearby business supply partner in Phnom Penh. According to Mr. T's brother: “In the past, I was angry and often complained to my brother on the inconvenience and frustration to wait for taxi driver in hot and wet weather to collect money for buying the locks supply. But using WING makes it easier to cash out my brother’s money from my WING account to pay for the locks supply. As a result, my relationship and communications with my brother has also improved. Because of WING, my brother now sends me money more often than before and I feel his family warmth and love to support my university studies and living expenses in Phnom Penh. Jeff Fang is a PhD candidate from RMIT University Australia and Project Team Leader of the project discussed here, which is evaluating how mobile money services are impacting the livelihoods of mobile money community sales representatives, customers and merchants/agents. Jeff is happy to hear any thoughts from any like-minded researchers and industry practitioners. He can be contacted at jeff.fang@rmit.edu.au or his LinkedIn profile at http://www.linkedin.com/in/jfang07. 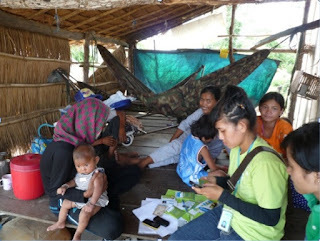 This is very helpful for Cambodian that WING allows any customers (individuals and businesses) to transfer, deposit (cash-in) and withdraw (cash-out) money between each other and with anyone in Cambodia as well as top up their pre-paid mobile phone credits with their SMS-enabled mobile phones at low cost.